Humanity’s farthest and longest-lived spacecraft, Voyager 1 and 2, achieve 40 years of operation and exploration this August and September — despite their vast distance, they continue to communicate with NASA daily, still probing the final frontier. The Voyagers have set numerous records in their unparalleled journeys. In 2012, Voyager 1, which launched on September 5, 1977, became the only spacecraft to have entered interstellar space. Voyager 2, launched on August 20, 1977, is the only spacecraft to have flown by all four outer planets — Jupiter, Saturn, Uranus and Neptune. Their numerous planetary encounters include discovering the first active volcanoes beyond Earth, on Jupiter’s moon Io; hints of a subsurface ocean on Jupiter’s moon Europa; the most Earth-like atmosphere in the solar system, on Saturn’s moon Titan; the jumbled-up, icy moon Miranda at Uranus; and icy-cold geysers on Neptune's moon Triton. Though the spacecraft have left the planets far behind — and neither will come remotely close to another star for 40,000 years — the two probes still send back observations about conditions where our Sun's influence diminishes and interstellar space begins. Voyager 1, now almost 13 billion miles from Earth, travels through interstellar space northward out of the plane of the planets. The probe has informed researchers that cosmic rays, atomic nuclei accelerated to nearly the speed of light, are as much as four times more abundant in interstellar space than in the vicinity of Earth. This means the heliosphere, the bubble-like volume containing our solar system's planets and solar wind, effectively acts as a radiation shield for the planets. Voyager 1 also hinted that the magnetic field of the local interstellar medium is wrapped around the heliosphere. Space is almost empty, so the Voyagers are not at a significant level of risk of bombardment by large objects. However, Voyager 1's interstellar space environment is not a complete void. It’s filled with clouds of dilute material remaining from stars that exploded as supernovae millions of years ago. This material doesn’t pose a danger to the spacecraft, but is a key part of the environment that the Voyager mission is helping scientists study and characterize. 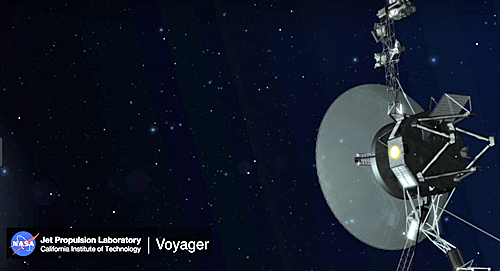 Because the Voyagers' power decreases by four watts per year, engineers are learning how to operate the spacecraft under ever-tighter power constraints. And to maximize the Voyagers' lifespans, they also have to consult documents written decade’s earlier describing commands and software, in addition to the expertise of former Voyager engineers. According to Thomas Zurbuchen, associate administrator for NASA’s Science Mission Directorate (SMD) at NASA Headquarters, he believes that few missions can ever match the achievements of the Voyager spacecraft during their four decades of exploration. They have educated all to the unknown wonders of the universe and truly inspired humanity to continue to explore our solar system and beyond. Ed Stone, Voyager project scientist based at Caltech in Pasadena, California, added that none of knew when the spacecraft were launched 40 years ago that anything would still be working and continuing on this pioneering journey. The most exciting thing they find in the next five years is likely to be something that none knew was out there to be discovered. Suzanne Dodd, Voyager project manager based at NASA's Jet Propulsion Laboratory (JPL) in Pasadena, California, noted that the technology is many generations old and it takes someone with 1970s design experience to understand how the spacecraft operate and what updates can be made to permit them to continue operating today and into the future. The Voyager spacecraft were built by JPL, which continues to operate both — the Voyager missions are part of the NASA Heliophysics System Observatory, sponsored by the Heliophysics Division of SMD.